A gas leak in San Jose that prompted evacuations Monday morning was capped in the late afternoon, and most of the evacuees were allowed to return to the area hours after the incident started, officials said. 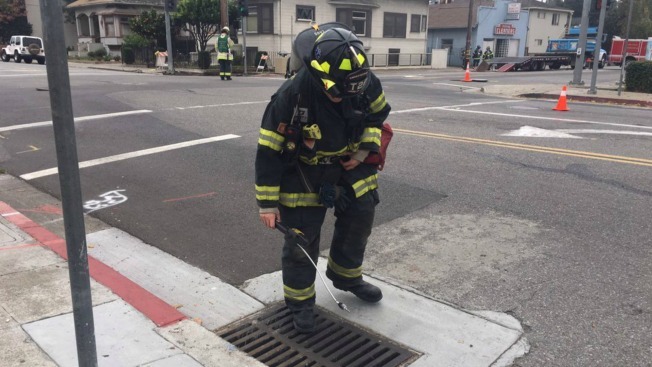 Those residing within a three-block radius around Race Street near Park Avenue in the South Bay city were evacuated by fire crews after a construction unit hit a 6-inch gas line at 1154 Park Ave. around 10:50 a.m., officials said. The workers also hit a sewage line, which prompted fears of a possible explosion. Dozens of downtown residents and merchants were forced from the area until about 4 p.m., when the leak was contained to half a block on Park Avenue. About 50 homes and businesses were affected by the evacuation order. "We did about 3½ blocks radius evacuation, and that based on what monitors were telling us," San Jose fire Capt. Mike Van Elgort said. Fire crews were using monitors inside manholes and storm drains to gauge the level of leakage, Van Elgort said. "Gas did travel into the sewer system," he said. Gas was still leaking as of noon, according to PG&E. Crews were working to cap the break while fire personnel continued to keep bystanders at a safe distance. Van Elgort said even after the leak was capped, fire crews had to be sure it was completely safe before people were allowed back into the area. "We will then go door to door and make sure there’s no hidden gas in any of the homes before we let people back in," he said. No injuries were reported as a result of the leak. NBC Bay Area's Damian Trujillo and Bay City News contributed to this report.